Staff at Blackhall Library are looking at ways to open the library’s garden space up for readers and community groups to use. It’s a lovely space to sit and read, you can even bring your own picnic! We’ve got other events organised over the summer too including a Teddy Bears Picnic, so please check out our Facebook Page. The fifth session (and the last of the season!) of the Edinburgh Photobook Club meets in the Art & Design Library, Central Library on Wednesday June 20 from 6:00pm to 7:50pm. During this session, we’ll be looking at how photographs and words interplay in the space of the photobook. Do they contradict each other? Are the texts necessary? Does the photographer use words in the pictures? How are the texts graphically designed (layout, fonts, colour)? If there’s a foreword, is it essential or just something that you usually can’t be bothered reading? Why did the photographer choose that title for his/her project? Participants are asked to bring their own photobook or choose from the wide selection at the Art & Design Library. At the beginning of the session, we’ll take 10-15 minutes to look through the selection of books. This will allow everyone to have an idea of the content of the books that will be discussed. Harry Potter’s having an amazing year, not only is the first book 20 years old, but the British Library have been joining in the celebration with their Harry Potter: A History of Magic exhibition. We’ve got our own display in the Central Library featuring specially designed panels, showing images of rare books, manuscripts and magical objects featured in the British Library’s exhibition, as well as images of material from J.K. Rowling’s own collection. Best part is the selfie opportunities though – its not every day you get to dress up in a robe and get your photo taken with Professor Snape! If you want to find out more about the British Library’s exhibition why not checkout Harry Potter: A History of Magic: The Enhanced eBook of the Exhibition and Harry Potter: A Journey Through a History of Magic. These two ebooks are now available through our OverDrive service and form part of our extensive collection of Harry Potter ebooks and audiobooks. All seven Harry Potter books are available on our OverDrive site in both ebook and audiobook format. You’ll also find spin-off titles such as Fantastic Beasts and Where to Find Them, Harry Potter and the Cursed Child, The Hogwarts Library Collection and The Hogwarts Collection. So why not re-read these special books or get hooked on Harry for the first time! Come to the opening of the Edinburgh Zine Library (E.Z.L) on Wednesday 1st November. Established in August 2017 and located in the Art & Design Library, the E.Z.L is a collectively run reference library of contemporary zines. Don’t know what a zine is? Come along to find out more, and why it’s important to collect and catalogue them! The event runs from 4 – 7.30pm and you can drop in anytime. There’ll be zine making workshops (materials provided) as well as some short talks, a zine swap, space to browse the collection and chat to E.Z.L members and the opportunity to contribute a page to E.Z.L’s first collaboratively made zine! Oh and cake! Lots of cake! Practical stuff: The Art & Design Library is not wheelchair accessible and there is no level access – using the lift there is an additional twenty steps. There will be an area downstairs which is level access and where there will be a stall, seats, zines and members of E.Z.L to chat. Get in touch for more information at edinburghzinelibrary@gmail.com. Kids are welcome, however they require the supervision of a parent or guardian! Do you need help getting started with Edinburgh Libraries downloadable ebook, audiobook, magazine or newspaper services? Or do you have a query about using any of the libraries online services? Then come along with your device to our eresources drop-in session. We can help get you set up and take you through using our services step-by-step. Drop into the acoustic pod on the Mezzanine in the Central Library on any Tuesday between 2 – 3.30pm. Contact informationdigital@edinburgh.gov.uk or 0131 242 8047 if you have any queries regarding this service. This year the Edinburgh Art Festival’s Explorers families programme comes to Central Library for free weekly creative art making sessions suitable for ages 8-13. These sessions are inspired by the EAF artist commissions programme and the ‘Making of the Future’ theme. Join us weekly or drop in for a one-off session to creatively re-imagine your city. Each session will look at a different artist and include 2D and 3D arts activities such as building a miniature bothy inspired by artist Bobby Niven, designing a modernist city after artist Toby Paterson and creating inflatable giant flower sculptures inspired by artist duo Walker and Bromwich. Create your own inflatable sculptures and model dragons inspired by Walker and Bromwich’s Dragon of Profit and Private Ownership. Design and build your own miniature bothys and dens inspired by Bobby Niven’s Palmhouse. Make musical instruments and write your own musical score inspired by Shannan Te Ao’s use of Maori songs and proverbs. Make your own 3D collage of a fantasy building, drawing on Paterson’s modernist architectural influences. Design and build a miniature installation in the library, of a future Edinburgh city centre inspired by the “grandfather of town planning”, Patrick Geddes. In celebration of the children’s work the outcomes of each workshop will be exhibited in the Children’s Library for the last week of the festival, 21-27 August. Come along to Colinton Library on the afternoon of the Wednesday 11th February from 2.30pm until 3pm and enjoy a delightful afternoon concert. 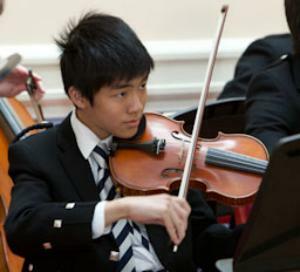 The pupils of Merchiston Castle School will be entertaining us with a range of classical and easy listening tunes for all to enjoy. Surely the perfect antidote to the winter blues! No need to book, see you there.